Can Wladimir Klitschko Resist Latest Irresistible Offer To Return? It seems the deep pockets of DAZN known no limits. WBC heavyweight champ Deontay Wilder may have turned down a reported $100 million offer to fight a series of fights on the streaming platform, but another big name heavyweight, Wladimir Klitschko, has also been targeted by DAZN. Reports out of Germany say the former long-reigning champ, who turns 43 on Monday of next week, has been offered the enormous sum of £60 million for three fights on DAZN. Klitschko, inactive since his thrilling but losing battle with Anthony Joshua in April of 2017, was offered £30 million to come back last year, “Dr. Steel Hammer” turning down the lucrative offer. But now, with the improved cash offer, might we see Klitschko change his mind and decide to roll the dice? It’s always been hard for fighters, many of them anyway, to either walk away, or to walk away and stay retired – with greats like Muhammad Ali, Sugar Ray Robinson, Sugar Ray Leonard and so many more legends coming back for one more fight. Imagine how hard it is for today’s fighters to retire and make it stick when there is this much money being tabled. No, Klitschko doesn’t need the money, as well invested as he is; but every man has his price. Might Klitschko find it all but impossible to turn down this kind of money, for three fights? 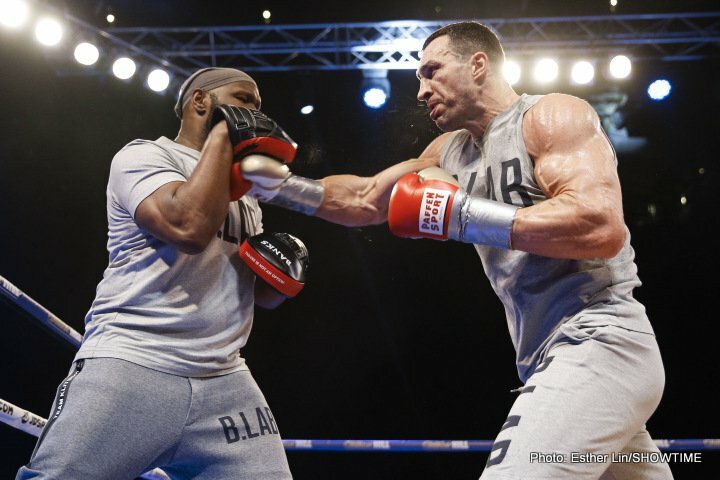 If he did return to the ring (and Wladimir has never strayed too far from the gym since his last fight), Klitschko would be trying to regain the crown he held for such a long time. The fans would likely welcome Wladimir back, and wouldn’t it be some story if he could, at age 43, regain the title. Dillian Whyte for one is (or was) convinced Klitschko will come back. DAZN has managed to secure the services of big stars Canelo Alvarez and Gennady Golovkin, and at heavyweight Joshua. Wilder took a pass (for now at least) – but could Wladimir Klitschko become the next superstar to agree to box on DAZN? What’s the old saying: ‘they all come back.’ It must be tougher and tougher for former champions like Klitschko to prove this adage wrong in today’s big-money times. You are here: Home / Boxing News / Can Wladimir Klitschko Resist Latest Irresistible Offer To Return?